This is not a post about food storage it is about Christmas and how to focus on Christ. I have been thinking about writing a post like this for a while. I have 3 young children. As a parent the thing that is most important to me about the holidays is helping my children come to know Christ. A relationship with Christ is a deeply personal thing. But how do our children develop one unless we show them how? Over the years we have experimented with a bunch of things and have settled on a few that really help our kids (and ourselves) come to better know Christ. 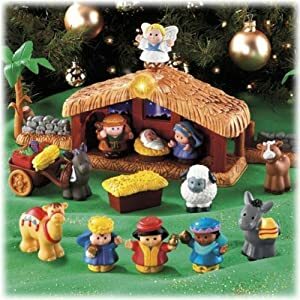 · Little People Nativity and I love it. When my oldest was just a tiny baby my wonderful neighbor (Jullie I am talking about you) showed me hers and helped me find one. I will always be grateful for the suggestion. Nothing warms my heart like seeing one of my children telling the story of the Nativity story to a younger sibling. · Nativity Puppets A few years ago my sister called me and asked if I wanted to make Nativity puppets with her. I was game for an adventure so we made a set for each of us. Since than I have been given some, and bought some (namely the sheep it is really hard to make a decent sheep). I love to use them for family nights, for Christmas parties, and I leave the out all season. I find that my kids put them on and start acting out the story quite a bit. 2. Have and Read the right Christmas books: Children learn a lot from a good book. Sadly not every Christmas book is perfect for kids. Some have too many words, complex stories, terrible pictures or are really just written for adults. We have found two that we really like. · Humphrey's First Christmas. I love it. I have read it about 50 times this year. 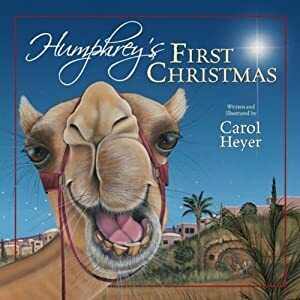 It is the Nativity told from the camel’s point of view, it has an appropriate number of words per page. It has a little humor. And every time I read it I feel the Spirit testify of the divinity of Christ. 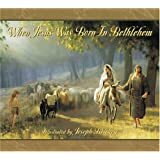 · When Jesus was Born in Bethlehem has the most beautiful painting of the nativity. The words are from the Bible but for my kids (and me) the painting really help me understand the meaning. I used to do everything. I sent Christmas Cards to everyone I knew, baked cookies by the truck-full, attended every Christmas event, had my decorations up the day after Thanksgiving, gave the perfect gift to everyone on my very long list, etc. Now I don’t. Don't get me wrong we do lots of Christmas activities. But we no longer HAVE to do everything. I used to hate Christmas. Now I don’t. I think the two are related. 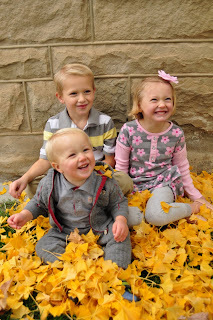 The pressure and stress of Christmas can be overwhelming, especially if you are the Mom. But it doesn't have to be. You can do less. If you hate Christmas and feel like you aren’t focused on the Savior chances are your kids feel that way too. I give you permission to do less. You don’t have to send Christmas cards, or sew homemade pajamas, or bake a million loafs of bread for the neighbors or whatever it is that is causing you stress. It will be okay; in fact it might be better. Two years ago my youngest son was born four days after Christmas. Needless to say during that holiday season I was not up to much. I did not put up the tree, I did not send Christmas cards, I did not attend holiday parties. It was a wonderful Christmas. One of the best my family has ever had. My friends still talked to me even though I did not send a card. What we did that year was only the basics. But we still were able to make wonderful memories and feel the love of Christ. Since the year we got a baby for Christmas, we have found greater joy in service, in family, and in the Christ. What things to you do to help your Children to better know Christ at Christmas?